About Us - De Leo Productions Inc. Founded in 2001, De Leo Productions Inc. was established in an effort to legitimatize Josephs independent film making endeavors. It has since developed into a full throttle corporate, commercial, music, and independent video production company. However, it will always have its roots deeply in independent film making. Traces of Josephs film style are evident throughout all his works. Joseph De Leo lives by the firm belief that "The Vision is all that matters.". Toronto born independent filmmaker & professional photographer, Joseph De Leo has one feature length and three short films under his belt. His rightful place is behind the camera, be it still or moving. His passion for film making and photography are clearly visible in the images he captures. His goal is to offer his services in the areas of professional video production and artistic photography. 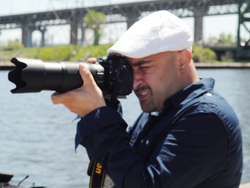 He is the founder of DE LEO PRODUCTIONS INC. , BUIO FILMS INC. and Oakville Photography.